How well is Microsoft's Windows 10 operating system doing after three months, and is its growth slowing down or picking up? Usage-share stats from companies like NetMarketShare are one indicator of how well an operating system is doing after its release. While the stats are not accurate, as they are based on large sample sizes instead of hard value which only Microsoft could provide, they do highlights trends. So, how are things for Microsoft's Windows 10 operating system? The rise continues from 6.63% in September 2015 to 7.94% in October 2015, an increase of 1.31%. Microsoft's other operating systems have dropped ever so slightly: Windows 7 fell from 56.53 to 55.71, Windows XP from 12.21% to 11.68%, and Windows 8.1 from 10.72% to 10.68%. Growth is slowing down a bit but that was to be expected since most customers interested in the free upgrade offer should have accepted it and upgraded their system to Windows 10 by now. Microsoft plans to deliver Windows 10 directly via Windows Update early next year which may push Windows 10 on systems running Windows 7 or Windows 8 and increase growth again. 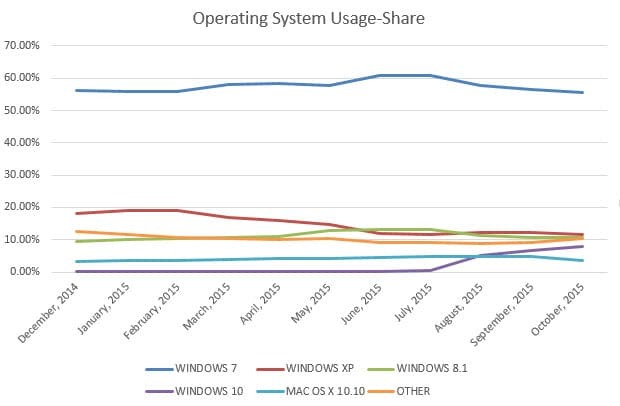 The almost 8% of usage-share makes Windows 10 the fourth most popular desktop operating system trailing Windows XP and Windows 8.1 by less than four percent. If the current trend continues, it will have surpassed both operating systems in less than four months to become the second most popular operating system. Windows 10's real contender is Windows 7 however and it seems currently that the majority of Windows 7 users have no interest in the free upgrade offer to Windows 10. And why should they? First, they have until next year to take Microsoft up on the offer. At least some are waiting for the first big feature update which Microsoft plans to deliver next year before they make a decision. The latter makes sense in a number of ways. First, it allows customers who are waiting to assess the state of the system after the first big update patch. While Windows 10 runs fine when it comes to day to day tasks already, it is apparent that it is in an unfinished state currently. November's Threshold 2 patch is a first step towards that goal bringing new apps and improvements across the board to the operating system. Another reason may be that customer's don't want to be burned by another Windows Vista / Windows 8 fiasco. What I mean by that is that it is not clear yet if Windows 10 will be a top priority for Microsoft in the foreseeable future, or if the company will move away from it quickly, like it has done with Windows 8, to create another operating system to sway consumers. It is unlikely that Windows 10 will share the fate of Windows 8 though unless growth slows down to a crawl in the coming months. Other customers may not be interested in Windows 10 because of the data collection that is going on, or because they don't want to change a running system. Considering that Windows 7 is supported until January 2020 with security patches, there is no need to hurry a decision. Now You: Where do you see Windows 10 in a year? The growth of the Windows 10 operating system continues in October, but it has slowed down just a bit when compared to previous months. Windows 10 inspired me to start looking at open alternatives for an OS. Something as important as the world’s primary operating system should not be in the hands of a private firm who can alter it in anyway they want a whim, or discontinue it entirely. So you prefer Linux and that’s good. Linux is a good OS, very secure and lots of access to features. However, accessing those features means one has to know the syntax needed to access those features from the command line. That may have been true of Linux 10-15 year ago, now days that’s not necessarily true for all or even most features, obviously if you’re a power user there are features that are only accessible from the command line but that’s equally true of Windows, most users will probably never have a need to make use of the command line. I don’t know anything about the reliability of commercial stats, I don’t know if Windows 10 usage-share wise announces a success, a half-sucess or a full to moderate failure in the future. What I know is that words are important, names even more in the way they echo in a user’s mind. “Ice-cream”, “cadillac”, “sunny” draws a smile, when “Windows 10”, IMO, creates a bad feeling among an increasing number of users, even if that feeling is one of doubt when doubt may lead to suspicion and therefor carry a negative incitement. “Windows 10” makes me frown. I really don’t think I’ll upgrade within the 1 year term. I’m most likely to stay with Windows 7 until it’s natural death and from there on (or before) engage a start with OS alternatives, Linux so to say. I’ve also noticed after having had a deeper look at Win7, with all the buzz about Win10’s privacy issues, that “Seven” itself is far more indiscreet that I had believed ever since I installed it in August 2013. In this way I’m grateful to Microsoft for having made its “privacy coming-out” with the new OS. Video games. The only reason I’m using windows. Although Steam and GOG have a fairly big catalog of Linux games, I can’t just abandon Windows completely. Going to keep Windows 7 until the need for DX 12 is unresistible. Dual boot with linux + Win10 Insider … both free. Use linux for everything except games (though some games work there fine, and growing..), then hibernate linux (no need to close everything down), reboot into Win10, play, reboot again back to hibernated linux, continue where you were. Should be quite fast if using SSD. You can even share partitions with data (though you have to be careful when hibernating!). Or use USB/NAS drive to share needed data to Win10, much safer. Thanks great comment. I dual boot Windows and Linux, so any advice or explanations of how to use Linux effectively is greatly appreciated. Someone already made a DirectX 10/11 patch for XP. Pretty soon, ppl will port DX 12 to Win7 too! Steam early access and pre orders for that matter are the worst game “investments” you can make. These things completly ruin the game industry taking money for something that is not yet finished, puts the pressure off of making an actual product that works. And now I think of it, Windows 10 is also still in early access, so bad thing to jump on that wagon. I am very skeptical of any usage or adoption stats regarding Windows 10 whereas Microsoft has resorted to trickery, deceit, and bullying to coerce, cajole, sneak, or force their OS onto peoples systems. I’d put more faith in usage stats than any claim Microsoft made about usage/installs, at least with usage stats we get a picture of how many people keep W10 installed after being tricked into upgrading. Microsoft’s forcing OS 10 on peoples systems is overblown. then they announced that they will push it as optional and if after 2 months you still not have given in into their demands, they will try to force it as a mandatory update. I believe that it’s quite clear that there is a resistance to “upgrading” being shown by 7/8 users, despite MS’s arrogant and forceful attempts to induce conversions. I think their new aggression being shown in terms of removing control from the end user, tracking/spying/telemetry, and basically using the OS as a storefront and ad-space is causing a backlash. I’m sure they’ll get plenty of conversions from the little old lady and noob crowd, but the power users seem to be holding their ground, and rightfully so, IMO. Windows 10 is the last OS to be released by Microsoft. Sure people are waiting for windows 10 to mature. This is to be expected. The hello feature is significant especially when it is integrated with passport. No more passwords. The OS will positively identify you and allow you to pay using a secure system without having to remember card numbers and passwords. Give it 6 months before you draw to much criticism. You are WRONG!! Win10 is to be the last W-I-N-D-O-W-S OS. That don’t mean they can’t or won’t make another one after it. What they CAN’T do is call it Windows 12 b/c they’ll get sued for lieing. Maybe they’ll call it M-I-C-R-O-S-O-F-T OS 1.0 instead! All they said was they won’t make another Windows, but that don’t preclude them from making another OS and calling it by another name! So what if Microsoft were to have another version in the future. But why should they? It’s easier for Microsoft to just add more features to Windows 10. It’s also easier for users to receive new features without reinstalling a new OS, which has always meant reinstalling tier 2 programs, as well as, backing up our files. Staying with one version and adding features is also a big plus for IT folks in the enterprise community. as if they can be sued for something they said, and that thing was in some resemblance a vague promise? he didn’t get sued for that either. Microsoft finally comes clean: Windows 10 data collection cannot be stopped. Period. O really? If the screen shows a “deactivated” button – can the average user find out if the sniffing still runs? Nope. Under W10 every machine is a remote terminal connected to Microsoft and they can control all functions. Funny fact BTW: Patch a powermeter between a W10-computer and the wall outlet and watch the powerconsumption with all programs closed but an e-mail client running. Type some “harmless” words like grandma, apple pie, cake and watch. Then, under same conditions, type in some “buzz words” like “syria, Asad, president, attack”… and watch the powerconsumption again. Due to the background network traffic a usual PC will draw 20 Watts more. Non-encrypted communicaion via e-mail is like sending telegrams in the 1940s.